As a mother of two young children, I’ve found that the children’s space at Madison Public Library in Madison, WI is an important destination for us on Saturdays. My kids get to be part of interesting programs, such as kids story time, and I get a bit of a breather as well as time for fun market research — firsthand observations about children’s libraries. Both at my local library and at other libraries I have had the pleasure of visiting in my role at Demco, I can see the flexibility and layered experiences that are now defining children’s spaces more and more. In addition, a compelling children’s library can spur an increase in patronage among parents and other adults who accompany children at the library and find something delightful for themselves. However, making your children’s library a destination, doesn’t just happen … it takes some planning. What are the characteristics of effective learning environments? Let’s break it down. Planning out your space can be a bit tricky. A children’s library has to be a lot of things at once — the illusion of multiple rooms within a room. TIP: Focus on your objectives and what you want to achieve with your space. One way to zone out your space is to group areas that focus more on individual and quiet activities versus those that involve groups and are more interactive. Offering a variety of areas also encourages a range of experiences and multiple ways to learn. Remember that managing your space is like managing your collection and to focus on where you are going to get the biggest bang for your buck. TIP: Opt for wildly interactive play stations and games that help kids fully experience their worlds. Swapping out activities periodically at children’s libraries also keeps kids interested and compels them to want to come back to the library to see what’s new. A print-rich environment is critical, but so is one that encourages interactive play, exploration and discovery. Play time is thinking time for children. The Playful Learning in the Library webinar showcases how the Barrington Area Library in Illinois took cues from today’s most interactive museum exhibits to make hands-on active learning part of the very architecture of its children’s library. In the simplest of terms, a creation space is any place where people can create, tinker, play, explore and discover through a variety of materials and tools. Whether you call it a makerspace, hackerspace or fablab, a creation space reveals inspiration and imagination come in many shapes, sizes and price points. Creation spaces can be anything from a table or a booktruck filled with arts and crafts supplies to a learning garden outside the library to a full digital media center. With creation spaces, you have the opportunity to offer services that engage users of all ages and backgrounds, address your community’s unique needs and support lifelong learning. Start small — Echoing the words of the New Mexico State Library, you want to offer an activity that’s manageable for your library. It could build on a staff member’s hobby or perhaps you can have a local expert or artist host a program. Think outside the walls — You don’t have to have a designated room for a creation space and it doesn’t have to be a permanent fixture in your library. Try a “pop-up” or mobile makerspace. Do a trial run — As with most things in life, practice makes perfect. Run through projects ahead of time, before you have a crowd so you can smooth out any kinks. Be flexible — MindShift suggests other ways to make creation spaces successful are to assess attendees’ skillsets, gauge demand and adapt accordingly. See some of the exciting possibilities for creation spaces courtesy of Demco Interiors’ recent Creative Spaces Support Lifelong Learning blog post. At the heart of every children’s library is enticing programming. Beginning at birth, your library can make a difference in a child’s life. Research-based storytimes like The Very Ready Reading Program not only foster early literacy skills, but also teach caregivers how to continue the learning at home. Plus, 1,000 Books Before Kindergarten programs give families the tools they need to prepare their children for later reading success. For school age children, you can build on STEAM principles being taught in classrooms. For example, see the STEAM & the Maker Mentality for School-age Youth webinar. I also recommend the Library Experiences That Engage Young Readers webinar for more great programming ideas. Get low — Decrease display height so that they are kid friendly. Pull out drawers on the bottom level work well too. Have fun — Cute, whimsical displays, like this, draw in kids like nothing else, making reading exciting and playful. 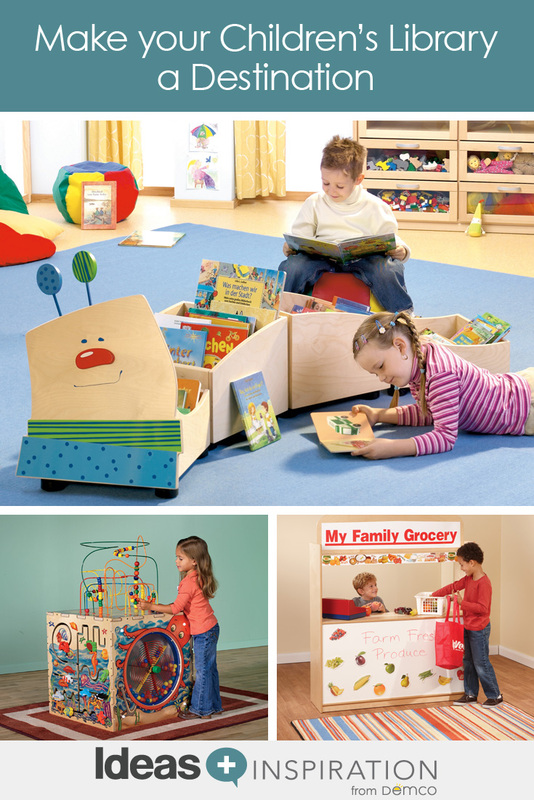 Be active — Make your displays interactive with LEGOs®, felt and Velcro characters, markerboards, activity boards, etc. End panels are also a prime location to do something unexpected. Nothing says strict and rigid like furniture that’s too heavy or bolted to the floor. It limits activities, discourages collaboration and detracts from the learning experience. Neither parents nor children are attracted to those kinds of setups. With the many activities going on in children’s spaces, flexibility is the name of the game. Consider adaptable furniture that can be picked up, rolled away or easily reconfigured to suit different activities. If I think about it, my kids are happy doing a lot of things. My husband and I joke that they would be happy playing with sticks all day. But, the kind of dynamic and enriching learning experiences they have at the children’s library go a long way in preparing them for life and that’s invaluable to me. Browse our idea gallery for even more fresh ideas about children’s spaces!